An allegation with implications of biopiracy involving a breed of cattle from Kerala remains unsubstantiated. AFTER environmental activist Vandana Shiva alleged in a magazine article in September 1997 that genes from the Vechur cattle of Kerala had been patented by the Roslin Institute in Edinburgh, United Kingdom, this near extinct breed of dwarf cattle shot into the limelight as a case of alleged international 'gene robbery'. Yet, there is no conclusive proof that such an act of biopiracy has indeed taken place. The controversy, however, has not been unproductive. The Vechur cattle, named after a village in Kottayam district where they were originally found, were once very popular for their comparatively high yield of high-fat milk, low fodder requirement and higher resistance to diseases, including to the foot-and-mouth disease. The Vechur cow's reputation as the ideal "backyard cow" that would meet the requirements of a small family had even led to a custom in Kerala of giving away one such cow as a wedding gift to daughters. The recent discovery that it is the smallest variety of cattle in the world (the adult cow reaches a maximum height of 90 cm) and that the smaller size of the fat globules in its milk makes it easily digestible and hence ideal food for children and convalescents has added to its reputation. In 1989, when the Kerala Agricultural University's (KAU) Centre for Advanced Studies in Animal Genetics and Breeding started a conservation project for the Vechur cattle, there were only a few of them remaining, that too thanks to the fancy that some people had taken to this desi dwarf. Today, a group of scientists led by the centre's Director Sosamma Iype, has reared over 120 of these cattle at the KAU farm in Mannuthy, near Thrissur, and started a programme of propagating the breed through distribution of cows and bulls. The KAU does not claim that what it has in its farm is the pure Vechur breed. According to KAU scientists, the conservation team collected from the geographical area surrounding Vechur village the most typical ones, based on their history and phenotype (appearance). They say that this is the practice adopted by animal breeders the world over in cases where the pedigree of an animal is not known. The university team's attempt has been to upgrade the most typical genetic characters in the progeny of a basic stock of about 30 animals thus collected in 1989. The project succeeded despite opposition even from within the KAU, motivated mostly by professional rivalries (which led in 1993 to a series of mysterious deaths of cattle in the farm, allegedly owing to poisoning; the deaths are now the subject of an inquiry). The conservation effort was generally appreciated within the scientific community and the project has been running with substantial support from the Indian Council of Agricultural Research (ICAR). HOWEVER, the project suffered a major blow with the allegation that Vandana Shiva made in the magazine Down To Earth that "the genes from the breed have already been patented by the Roslin Institute" for research on molecular and quantitative genetics of farm animals and poultry. On subsequent occasions, however, Vandana Shiva offered different versions of the allegation - such as that the Roslin Institute "has surreptitiously obtained the embryos of this rare Indian breed to facilitate their patentable transgenic research" and that the "Roslin Institute has smuggled embryo (sic) of a nearly extinct breed of cattle called Vechur from Kerala in India and is reportedly attempting to patent its genome" (this became the basis of a news story in Nature on August 27, 1998). By then a controversy had broken out in the Malayalam press, and the KAU, which initially made no attempt to challenge the claim, was forced to do so. In reply to a letter from Sosamma Iype, which sought clarifications about her allegations, Vandana Shiva wrote to the university in August that "the patent claim could be on a breed of cattle derived from Vechur and not necessarily on the Vechur per se" and that she had made her allegations based on "an application for a patent, which has used the Vechur germplasm to evolve commercial breeds." Still later, she said in media interviews that the Roslin Institute "has removed the reference to the Vechur cattle from their Web site because of the controversy". In short, the allegation itself was not clear, and there was no evidence to support any of Vandana Shiva's statements (the only "evidence", the reference in the Roslin Institute's Web site to the patent application, was "removed". However, the demand for an inquiry into the alleged "bioprospecting links" between Roslin and the KAU which received wide publicity in the media, has remained. Dr. Shyamasundaran Nair, KAU Vice-Chancellor, told Frontline: "Nobody can arrogate to themselves the right to patriotism. Vandana Shiva should recognise the integrity of her fraternity. Patent searches conducted at the request of the university by ICAR officers and scientists at the M.S. Swaminathan Research Foundation have drawn a blank. Export of live cattle is encouraged in the country and cattle from Kerala might have been going out. In that respect, it is still a free-for-all situation. But the university is confident that no Vechur germplasm has gone out from its genetically upgraded stock of Vechur cattle. I will support my scientists fully on this and the Government or any other agency is free to conduct an inquiry. The university will provide all material and help to any such agency." One of the KAU scientists who were recently at Roslin, Assistant Professor A.P. Usha, told Frontline that while at the Institute on a research project on Dexter cattle (another dwarf breed), she had informally discussed with some scholars there the existence of the Vechur cattle and suggested in writing to the KAU the possibility of a collaborative research with Roslin on them. "The proposal was rejected by the then Vice-Chancellor, A.M. Michael. But when I returned, I found a big controversy had bloomed in some local newspapers that 'KAU scientists and a foreign firm had hatched a conspiracy for lucrative biotechnology research on Vechur cattle.' The fact remains that the proposal was rejected and that was the end of it," she said. P.G. Nair, former Director of the National Bureau of Animal Genetic Resources (NBAGR) in Karnal, Haryana, now based in Thrissur, described the entire controversy as "ridiculous". "Vechur cattle is special in that their milk production is higher - but only when compared with that of other native cattle of Kerala. However, compare its production of three to four kg a day with the 40 kg to 50 kg a day of an exotic breed like Holstein and its economic value becomes clear. Its supposed value owing to the high fat content in its milk is important only in the Indian context. The trend the world over is to produce animals that give low-fat milk. The suggestion that the Vechur germplasm has been smuggled out, especially because of the alpha-lactalbumin found in the Vechur cow's milk, is absurd because this protein is found in the milk of many mammals, including humans," he said. BUT why conserve the Vechur cow when a milk-starved State has already used cross-breeding technology successfully to upgrade its native cattle with high quality Indian and foreign breeds in order to boost milk production? 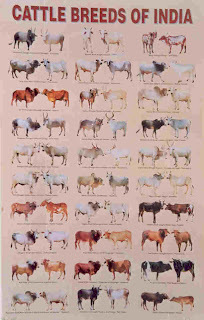 Native cattle varieties like Vechur have evolved by natural selection over generations and this has led to their high adaptability to local conditions. This is also the reason why they are more resistant to diseases like foot-and-mouth or have more tolerance to hot conditions. There are only 26 well-defined breeds of cattle in India and they make up only 18 per cent of the total cattle population. The rest, which include the Vechur, are categorised as "nondescript" cattle. These cattle, which evolved by natural selection, have unique pools of genes developed by nature over the years. But such natural adaptation has, in most cases of nondescript cattle, come at a cost: low economic value in terms of milk production. Cross-breeding programmes were the easy and practical way out to increase productivity and to create only the most desired qualities in an animal. In the process, over the generations, the increasing population of cross-bred animals had more and more of genetic commonness and less and less of genetic variety. Extensive cross-breeding (by the time of the 1977 Cattle Census more than 45 per cent of the cattle in Kerala were of the cross-bred variety) also closed the door for the evolution of new breeds through natural selection. As in the rest of India, this resulted in a substantial loss in terms of genetic wealth of domestic animals. It is therefore the invaluable genetic pool that makes endangered native cattle like Vechur so important to scientists. According to KAU scientists who are involved in the Vechur project, high-yielding cross-bred cows and sophisticated management alone can take a State like Kerala towards achieving its target of increasing milk production at the rate of 30 lakh tonnes a year. The Vechur cattle may be attractive only to a small householder who cannot afford sophisticated management but would like to be self-sufficient only in terms of milk. One of the scientists told Frontline: "Rearing of cross-bred cows and conservation of local cattle are not mutually exclusive. The real importance of the university project is the preservation of the invaluable genetic pool in these animals that are on the verge of extinction. Until conclusive evidence emerges, the question whether the Vechur germplasm has been smuggled out and patented elsewhere can only remain in the realm of conjecture. However, the controversy has pushed the once-little-known Vechur cow into the spotlight as a symbol of India's unique biodiversity of domesticated animals that face extinction. Again, it has exposed the inability of the country's official and scientific machinery to prevent piracy in animal genetic resources. As the KAU Vice-Chancellor asked, "What foolproof machinery do we have to prevent it?"